Gabriel means “Messenger of God”. It was Gabriel who announced the time of the coming of the Messiah to the prophet Daniel. He appeared to Zachariah in the Temple to announce the birth of John the Baptist. Of course, his most famous announcement was when he approached the Virgin Mary to ask her to be the mother of God. Gabriel's words echoed throughout the ages as his greeting “Hail Mary full of grace, the Lord is with thee, blessed art though amongst women...” became part of the Hail Mary prayer. The lily often symbolizes Gabriel because of his offer of never ending purity to Mary. After Elizabeth conceived and was six months pregnant, Gabriel appears again. The Book of Luke states he was sent from God to Nazareth to visit the virgin married to a man named Joseph. Gabriel said to Mary, "Hail, thou that art highly favored, the Lord is with thee: blessed art thou among women." Luke 1:28. "Fear not, Mary: for thou hast found favor with God. 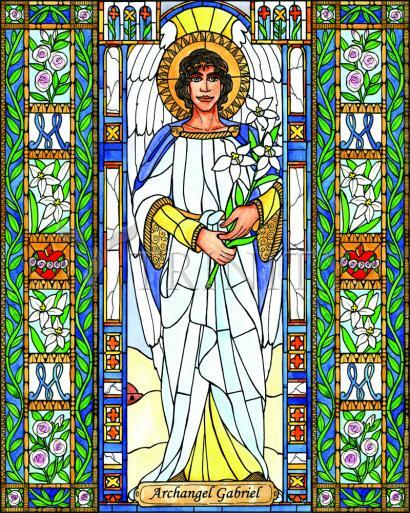 Gabriel's attributes are the Archangel; he is clothed in blue or white; and is seen carrying a lily, a trumpet, a shining lantern, a branch from Paradise, a scroll or a scepter. In art, Gabriel is often represented in the scene of the Annunciation.